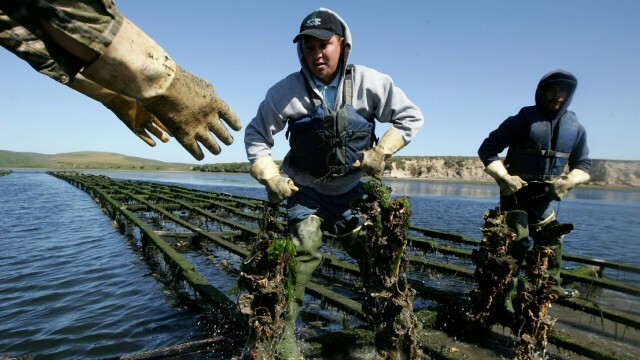 The embattled Drakes Bay Oyster Company is facing a new challenge to its operations at Point Reyes National Seashore. The Sebastopol-based environmental group California River Watch says that the oyster farm is polluting the waterway known as Drakes Estero, and is threatening to sue the company. containing biological waste such as shells, shellfish parts, unwanted shellfish and other pollutants such as bleach, ammonia, other cleaning solutions, as well as packaging wastes (plastic and paper), discharge from an outfall pipe directly into Drakes Estero. Kevin Lunny, owner of the oyster company, counters that the threatened suit amounts to a shakedown. "There are no pollutants," he claims. "The discharges that they're talking about? From our shucking and packing operation? That all goes into a septic tank and into a septic system that's pumped over the hill and disposed of under ground into a septic system. None of that meets receiving waters." Lunny says he's consulting with attorneys to figure out his next steps. Meanwhile, the oyster company is embroiled in another legal fray, over whether it can continue operating at all. A federal appeals court is currently considering that case.